The beer world is full of colourful characters. We all know the charismatic brewmaster, the bartender whose knowledge knows no bounds, the homebrewer who'll be brewing commercially some day and the passionate beer devotee sitting across the bar. Indeed, perhaps the most beautiful aspect of the craft beer scene – second only to the beer itself – is the people that inhabit it. Hence The Crafty Pint's Beer Nuts series, which aims to turn the spotlight onto beer's most colourful and passionate devotees. Few characters come more colourful than Melbourne's Rosemarie Ensink. 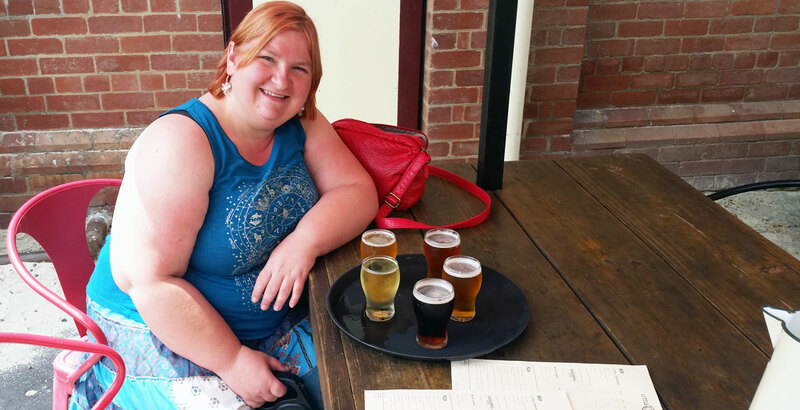 Some will know her from her role as committee member of the Merri Mashers, others from crossing paths at a major festival or beer tasting – or perhaps from playing Cards Against Humanity while sharing any number of rare bottled beers. It's also worth noting that Rosie is as passionate about her Richmond Tigers as she is about beer and, much like fellow Beer Nut 'Manda Lê, she is easily recognisable by her lively colourful hair. And here, in her own words, Rosie from Reservoir – "Not 'Reser-vwar' or 'Rezza' but 'Reserv-wor!'" – takes us deep into her beery obsessions. Medical nurse, working at Epping and sometimes Broadmeadows [Hospitals], mostly in palliative care. So, working with people who are terminally ill. I love it, it's one of the most difficult but rewarding areas. Are you a nerd, geek, aficionado, snob, wanker or something else? [Laughs] I have my moments! I have glass rage. I don't like beer being served in the wrong glass. The whole schooner versus pot versus pint [debate] drives me nuts. I guess I'm a beer lover, I want everyone to experience it for themselves. I can't understand why people would want to drink something like Corona just because they want to drink something that doesn't taste like anything. If that's what they want to do, far be it from me to stop them, but I do believe everybody will find something they love in beer. When people say me to me: "I don't like beer," [I'll reply]: "Well, you haven't tried every style of beer!" They've only tried a slim minority of beer styles. My friends and work colleagues know me as a beer geek and aficionado. Some know me as a snob as I cringe when they say: "We're going out to have a bucket of Coronas!" But they've tried a lot of stuff I've given them and a lot of them have come around and said: "She does have an idea of what she's on about – maybe we do need to try more stuff that's a bit different." Since about 2003. [At that time] I'd moved to Melbourne from the country. I'd done a lot of the international beers like Kilkenny and Belgian stuff. When I came back here I wanted to find local beers that weren't CUB, so my brother and I went out and investigated a couple of places. We came across James Squire's brewhouse in the city where [James Squire beer] was actually fresh. I thought: "Wow, this is amazing!" I investigated further and I wanted to know who the brewer is, I wanted to know where [a beer] comes from and I wanted to know what's in it. I enjoy it more if I know it's something someone has done with love. We then started going to Mountain Goat and Holgate regularly, and now I seek out as much different, flavourful stuff as I can find. Also back around 2003 I stumbled upon Harvest Cellars in Northcote who brought in a lot of American and international beer shipments as well. They had an amazing selection of different styles and flavours I'd never had before which was just brilliant. I love the flavours, the variety and I love the people! Interesting people who are in it for so many interesting reasons. The main thing about beer is it's socially binding. You can sit down over a few drinks, and it starts a conversation. It brings people together at the end of everything. I'm not a wine drinker, unfortunately for my family who are all wine drinkers. My Dad, who is Dutch, said at 13: "You've got to start having a drink of wine with your dinner." But I could never get into wine, so I started having a VB with dinner instead. In hindsight, I would never have figured that as a pairing! What is the most extreme act of beer obsession you have ever committed? Taking a week off for Good Beer Week maybe...? It's become a yearly ritual now. It's become such a regular part of my life; going to events, seeing people and chasing the next big flavour. Beer paddles are probably my obsession. Do you document your beer consumption? If so, how? I use Untappd and I take photos. I have way too many photos of beer on my computer at home. It's capturing the moment in a way. I can look back and think: "That was from Good Beer Week, this was an amazing beer," or "That's when I met [a particular] brewer." I'm a bit embarrassed about my number [on Untappd] but it's kind of cool because it shows that beer is a big part of my life. I'm a badge whore, but there's nothing wrong with drinking a beer to get a badge. It opens up your mind, it could be a beer [style] you might not have looked at otherwise. It's really social because you can see what everyone is drinking and what other people are tasting. I'll comment on a beer that's not supposed to be sweet or it's supposed to be salty and someone else might say: "I didn't get that." I'll look at five comments that say a beer is hugely hoppy but I'm thinking it's not really the hoppiness – there's a flavour coming through that isn't quite right. Untappd provides a comparison of where your palate is at with certain beers. I've met a huge amount of people through Untappd, which is quite hilarious! I'd be sitting across the bar and I'd say: "Hey! Are you this person?" There's a couple of guys who come into Carwyn Cellars every Friday who I always catch up with now who I met through Untappd. I've met plenty of people in Sydney as well, some I met previously and we became Untappd friends. I also document beers on the Beer Thread and CBC (Australian Craft Beer Crew) Facebook groups. I actually met Matt Brown, one of the founders of the Craft Beer Crew many moons ago at the first GABS. We've kept in touch since then and it's cool seeing what other people are drinking at home. But there are some photos I really don't need to see, like I don't want to know what you're drinking on the toilet or in the shower! Which beers have blown your mind? Cantillon head brewer Jean van Roy, brewer of some of Rosie's favourite beers. I love complex beers that have 16 things happening at the one time. I really like salty goses. I absolutely love Hop Nation, Exit and Big Shed's Black Rhino Cherry Lips. It was dark but it was funky and pretty damn good! I had it for my birthday and thought it was awesome! 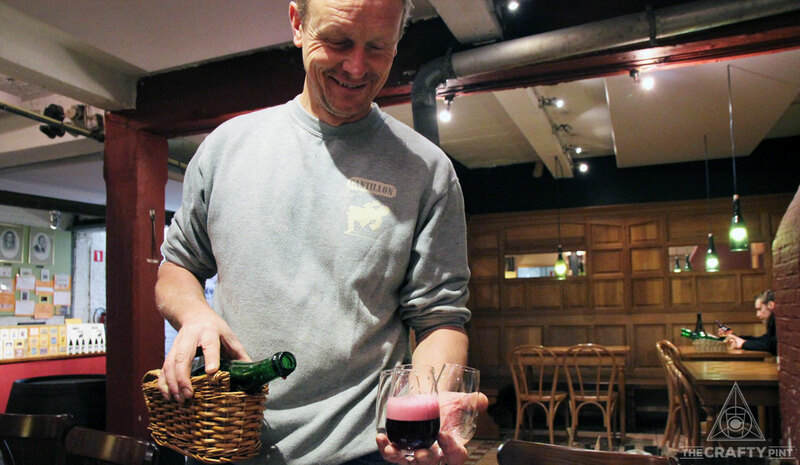 Cantillon, especially Fou' Foune, and Alvinne are two other favourites. Fou'Foune I had twice last year. A friend of mine bought [a bottle] for my graduation in 2014 and I kept it for another happy day, so I had it on my birthday last year. [Carwyn Cellars] had it on tap for Good Beer Week too. I love Moon Dog because they're not afraid to try different things, even if it doesn't work! And which have been your worst? Miller Chill! I had it during one of my Good Beer Week "Previews. "* I actually don't mind Miller Lite. I don't think it's terrible. I don't know what the hell they did with the Miller Chill but it was really phenolic, really funky... And then they added lime cordial! It didn't work well... [Laughs] It was like off lime cordial that had crystallised on the window sill. It had a really funky sweetness. That was Miller Chill! How many beer / brewery t-shirts do you own? Not many really... About 30 [laughs]. I've got four I'd wear out, but [most are from] way back. How many types of dedicated beer glassware do you own? I've got two shelves in my kitchen dedicated to glassware. Then I ran out of room, so I've got a little shelf above the stove. I've got a mantelpiece that's covered with glasses and I've also got my loungeroom edges covered in glasses too! When people come over to my house it's a free-for-all. [I'll say]: "Get what you like, I'm not going to serve you." But unfortunately I've said a couple of times: "Don't drink out of that glass because if you break it I'll kill you!" But my Red Hill glass is my favourite. I have a couple of boxes of paraphernalia, a couple of posters on the wall in my bedroom but I wouldn't say a shrine exactly, other than the glassware in the living room! I love branded bottle openers, especially the long bar ones. How many unique beers so you reckon you've consumed? Rosie waiting patiently to help drain Mornington Peninsula Brewery's final keg of Imperial Stout at one of our Crafty Cabal events. My Untappd number [of check-ins] is 4,300... That's after six years of being on Untappd. [All up] I'd say 5,000. I love 150ml [servings] as I can have five and still be okay, rather than drinking pots. I did all of the beers at GABS [this year] except eight I think. That was a bit crazy! Each year I look at what I want to try, as I know I can't try everything, but this year my friends and I decided we would share. So everyone [in our group] was handing everything to each other. At GABS, many [festival] beers are near 13 per cent so it's hard. But we had full glasses of some, like Stockade's The Mountie, because we knew straight away it was going to be awesome. How much money do you spend on beer and beer related products (not including kebabs)? When I'm trying to be good, I keep bottled beers in my cellar, which isn't really a cellar but a cupboard. Unfortunately, when I'm not doing bottleshares it gets out of control, so at the moment my cupboard is full and three other boxes are full with beer. Plus the top of my desk is now full too! 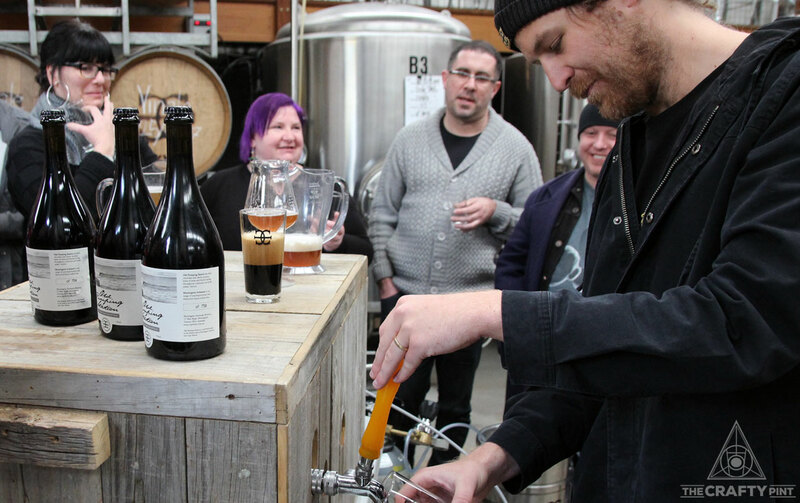 I'm getting a beer made for me funnily enough – that I can't drink! When I did an interview for a TV show [A Moveable Feast] during Good Beer Week, they asked me if there was a meteor coming down on Earth what would be the [last] beer you'd like to drink? I said it would be something very dark, rich and complex, but a bit of fruity sweetness there. And a bit salty, well everything! So, it will be made, my End of the World Beer, the last beer that I will ever drink. But of course I can't drink it because it won't be the last beer that I'd ever drink! It's a bit of an in joke. But the Black Rhino Cherry Lips probably comes close. Cheers, Rosie. 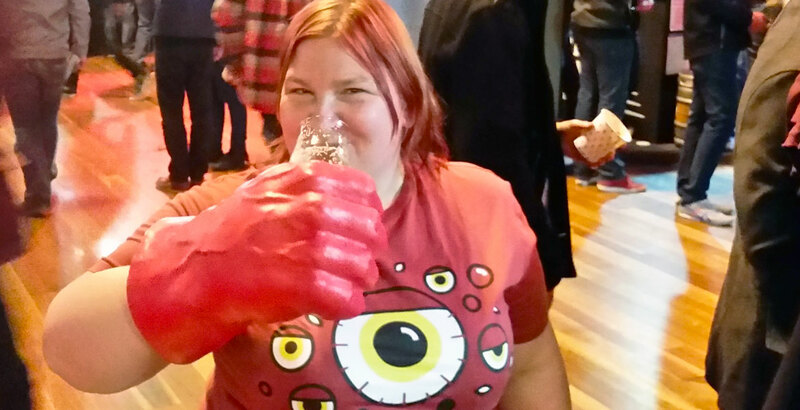 You can find her at monthly Merri Mashers Home Brew Club meetings (send a join request to the club's Facebook group page for more info), or follow her on Untappd, where she is @moodkiller81. * Prior to each year's Good Beer Week, Rosie does a "GBW Preview" in which she finds a week's worth of macro lagers to see where they're at and what the majority of the world's beer drinkers are consuming.